In the beginning our Founder, A.M. Lynch Jr. purchased the Sinclair Oil Consignee business from local Osceola County businessman Stanley “Chicken” Overstreet. The date was July 1, 1969 and Osceola County was still a small agricultural and ranching community. That was a big year for the newly formed Lynch Oil Company; it was awarded the Osceola County School Board Diesel fuel bid at $.13 per gallon for the year, BP Oil Corporation bought out the Sinclair market and subsequently signed on Lynch Oil as a BP Marketer in November, and A.M. Lynch Jr. also purchased the assets from BP and no longer was considered a consignee. December of 1970 marked the beginning of Lynch Oil’s decision to move into the Service Station business with the purchase of the NE corner lot on Patrick and Bermuda in Kissimmee and built a two bay gas station with a car wash. Disney World announced future plans to develop a theme park, and no longer would Kissimmee be considered a small agricultural and ranching community. In 1974, American Petrofina Company of Texas (FINA) purchased BP Oil’s marketer network and Lynch Oil instantly became a FINA distributor/marketer. Throughout the 70’s and 80’s Lynch Oil expanded their retail presence by adding eight more gas stations including the new concept of the Convenience Store. They also added Texaco and Phillips 66 brands to their portfolio. In 1978, Lynch Oil became incorporated under the new name, Lynch Oil Company, Inc. In 1979, Lynch Oil Company, Inc. bought out longtime Texaco marketer Jabco from local Osceola County businessman J.A. Bovis and merged both operations in 1982 under one roof. In 1989, Lynch Oil Company, Inc. sold all of it retail operations to Star Enterprises (TEXACO) and this marked the time when Lynch Oil Company, Inc. adopted the motto of “Fueling Your Success”. Lynch Oil Company, Inc. has been steadily growing organically ever since and have had the opportunity to purchase Orlando based R.C. Dunn’s Fuel business in 2006, Ocala based Diamond Oil’s wholesale fuel and lubes business in 2008 and more recently the purchase of longtime New Smyrna Beach marketer Exum Energy in 2014. 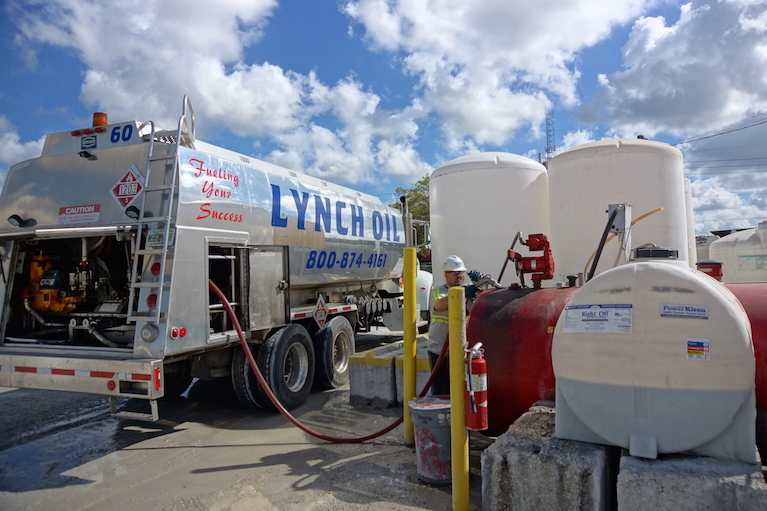 Lynch Oil Company, Inc. now markets in over 30 counties in Florida with a 99.9% reliability factor…..we do not let our customers run out of fuel! On August 1st, 2016 Lynch Oil Company acquired the commercial fuel division of J.H. Williams Oil Company, expanding our service area on the West Coast of Florida South to Englewood. Providing Lynch Oil Customers with yet another location to Top load their service trucks with Ultra Low Sulfur Diesel, Dyed Diesel, 90 Recreational (non-ethanol) gasoline, 87 Unleaded gasoline and Diesel Exhaust Fluid.